Two months after Wiggles was born I decided to invest in THE MOTHER of all teething toys. The most famous, the most revered, the teething toy with the best reviews in the whole history of ever.... yes I spent several of my pennies on a Sophie the Giraffe teething toy for my baby girl, as quite frankly she deserves the best. Vulli who make Sophie designed her in 1961, the design has never changed and she has a fabulous retro look to her. All their Sophie's are made to exactly the same specification. We ordered ours from Amazon and I wasn't disappointed. Two friends of mine popped over with their babies. They both owned and had brought with them their little ones Sophie the Giraffe teething toys. I had never seen another toy up close and was a bit concerned to discover that theirs were both identical, but that they looked quite different to my own. Despite some pretty heavy gumming and subsequent washing theirs had all their spots and they were much darker in colour. The shape of their toy's eyes were quite different and they each had very pink cheeks which our Sophie doesn't have. Their toys were also notably smaller than ours and the colour of the rubber was quite different. Theirs were also almost white, ours is a yellow colour. The legs of the other giraffes were also quite a different. On the left we have Exhibit A - Sophie the Giraffe - photograph courtesy of the Amazon website. On the right, our Sophie. The suspected Faux-phie. Alarm bells started ringing, if every Sophie was supposed to be made to the same specification how could ours be so different? I'd heard of knock off handbags, shoes and that sort of thing, but surely no one would stoop so low as to produce a counterfeit baby toy? I emailed Amazon as soon as possible, on the Sunday afternoon explaining my concerns. I heard back from them by 9.00 am the very next day saying that they had received my email, they were taking it very seriously and they would investigate and get back to me. In the mean time I was welcome to a refund, but they wouldn't be able to give me any indication as to how long this enquiry would take. I wrote back saying I was happy to wait. This wasn't about money, but safety, I just wanted to know my baby hadn't been poisoned with a counterfeit Sophie the Giraffe! By 1 o'clock the same day I received a response from Amazon. They had tracked their supply chain back to the Vulli factory in France and were happy that our toy was genuine. Not only that but they had contacted the factory and raised my specific concerns with them. 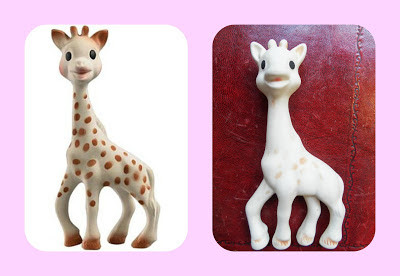 The factory had advised that the Sophie the Giraffe toys are made in plaster of Paris moulds, each mould can make ten Sophie's before it needs to be replaced, hence the subtle differences in size and shape. Then each Sophie is hand painted, hence the differences in depth of colour. So it transpired that I was having an irrational mummy panic and that I'd been accusing two perfectly reputably and frankly enormous bloody great big companies of flogging knock off and potentially poisoning my child. Ahem... But instead of just ignoring me, or wafting me away like the wally that I am they dealt with my query sensitively, thoroughly and quickly. And I was really flippin grateful, if a little embarrassed!!! I am so pleased we have a Sophie and not a Faux-phie!!! Have you ever been caught out with a counterfeit? Or made an international muppet of yourself? I'd really like it if someone said it wasn't just me!! I know there's a huge problem with fake Ergos! I'm glad your Sophie was real in the end, Eloise loves hers and just got a bunch of Sophie books from her Grandma. They do BOOKS!!! I didn't know!! Are they good? I'd love to know? Amazon is the bomb! We adore them- so efficient & great customer service. And YAY for the real Sophie!! I agree! They could have just waved me away politely, they'd have had every right! I love that! I would have done just the same, spent hours researching it, and then ended up just as pleased regardless! How funny! I know what you mean, sometimes I am really grateful when the batteries go in the particularly annoying toys! Hello there! I was wondering if you knew the name of the Amazon seller you bought the Sophie from? We lost ours and we are about to buy another and I just wanted to make sure it was the real deal! :-). Thanks so much! Are you sure you purchased yours directly from Amazon? Most of the listings I see are from third party sellers, and most of the sellers are selling fakes. You have to have a brick and mortar store to sell Sophie, they're actually pretty hard to get an account with. If you read the reviews of Amazon, there are TONS of complaints about fakes.